this a picture of my office. disorganized/not enough space – i go to put something away and i don’t know what to do with it. if it doesn’t have a place, i’ll just set in down and commit to getting to it later. later never comes. a dumping grounds- Mary ask me to take care of a pile of stuff. i have no place for it and i am generally not in the mood to make a decision or there is no place for the thing, so i just stow it away in my office. 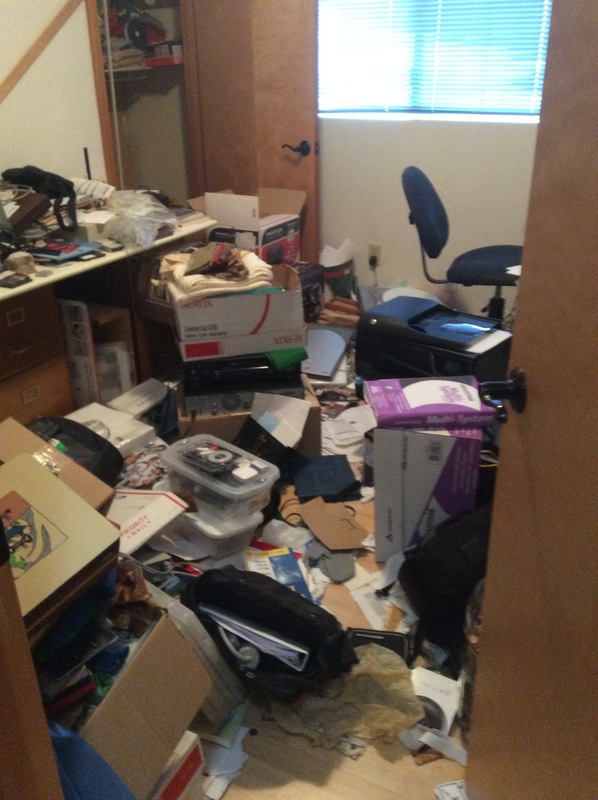 a mess begets a mess- The room became a mess. I have something to put away. it may even have a place to go where is make some sense. i enter the office. let’s see, if i step over this pile to step over that pile to step over another pile to step over yet another pile, i could put it away. nah, that’s too much effort, i’ll just drop it here. load the data to a floppy. find a newer computer, which i don’t have, that still has a floppy but with ethernet capabilities. network it to an even newer computer, which i don’t have. make sure it has the right version of network software and i could finally transfer it to my current machine. see, only three step. though, my syquest drive that would work on the mac plus was a massive 40 mb or storage. knowing my computer usage at the time, only a small portion of that would be dedicated to data. furthermore, does anyone remember wordperfect? i do. its file format is convoluted which makes it hard to even easily copy the text out of a raw text file. their formatting was inline. if i haven’t looked at it in two decades, how important is the data, anyway? i hold on to stuff, thinking, hoping it will be useful to me or someone else at some further date. This goes beyond the office. i don’t have a clue of what to do with whatever is in my hands. the anxiety builds quickly. the only way to escape it, is to get what ever out of my hands. it gets added to the pile of unknowns. If you remember advanced algebra at all, and equation of so many unknowns needs at least that many equations to solve for the unknowns. the pile contains a lot of unknowns and will require many more equations just to solve it. of course the analogy between my office and my mind, are frighteningly similar. i keep hold of stuff, hoping that those thoughts or experiences might help me or someone else some time in the future. most of the time, they just weigh me down. I have something in my life that i have no clue how to handle. i find my pile and add it there. slowly the anxiety abates but the residual remains. perhaps, adding it to the pile is a good short term solution, but not so for the long term. where do i go from here? first, what has writing this done to me? as i wrote this i could begin to feel the anxiety build. the anxiety has increased to such a level that a knot of fear has taken up residence in my pit of my stomach. fear? what fear? three rear the ugly heads; the fear that i’ll get rid of something i’ll need next week, the fear i won’t do it perfectly (perfectionism on a pile of stuff, jees), and the fear that like so many times before, i would not be able to complete it (fear of failure). enumerated the fears only made the knot a little tighter. i guess i’ll make the decision to move forward like george mallory did and attempt to climb my mountain. hopefully my outcome ends up a little better than mallory’s. mr. mallory attempted his summit of mt. everest in 1929. evidence found in 1999, the photos on his camera, show he succeeded in summiting his mountain. unfortunately, he succumbed to the brutal conditions on his descent. This entry was posted in acceptance, analogy, anxiety, emotions, fear and tagged anxiety, fear, mess, office, pile on 2015/10/19 by bipolarsojourner.